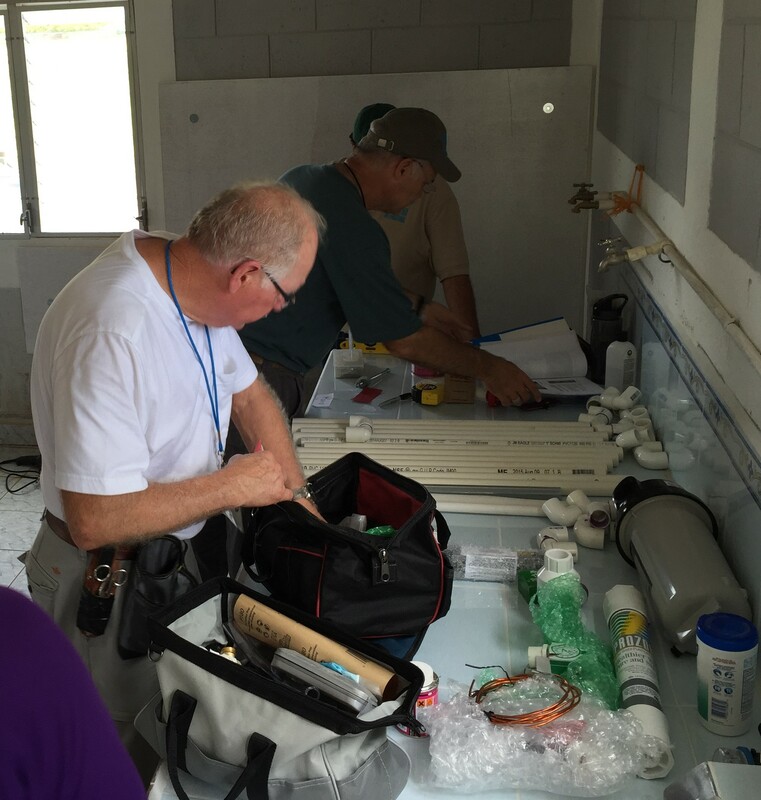 The main reason that my team traveled to SOHW was to install a water purification system. Up until this point, they have been using a rudimentary filtration that did not remove nearly enough bacteria and parasites from the water. After we left, their water was cleaner than the pure water that they could purchase. No more bloated stomachs. No more constant diarrhea. No more parasites causing malnutrition. As of November 12th, the children and staff of this project are being given healthy drinking water, thanks to the hard work of Dale, Harold, David, Mike, and others…who worked long days on Monday-Tuesday-Wednesday to make it happen. While they were installing the system, Andrew Ferdon and I were educating the kids on personal hygiene and the uses of clean water. We showed them what germs look like under a microscope, what proper hand-washing technique is, and how germs can transmit from person to person using special lotion and a black light. The kids loved all of the hands-on learning from the Agua Viva curriculum. Honestly, I think my personal habits have changed since teaching this class. When you put someone’s fingerprints in a special petri dish… and then two days later see giant colonies of bacteria…it makes you think twice the next time you consider eating without washing your hands. Even the “clean” water from my water bottle grew some bacteria cultures, which freaked me out a bit. But thankfully, nobody on our team got ill for more than a day. In our education, we focused not only on teaching the material, but teaching young people to be teachers of the material. The Magdalena House was a group of 15-19 year old girls who were transitioning out of the orphanage into their next season of life. (On a side note, it is unheard-of in this culture for young women of their background to wait for marriage and pursue their dreams…but that’s exactly what many young women have done with the support of this great ministry. Praise the Lord!) We surprised several of these girls with the challenge of getting up in front of all of the kids in the afternoon and teaching the same material that we taught them in the morning. They did such a wonderful job! As the week went on, they became more confident. Annabella was articulate when she taught toothbrushing technique with our big practice teeth (dientes grande). Aryles made the whole class laugh as she taught from the powerpoint that we provided. And Sulmy perfectly conducted the germ-spreading activity with the glitter. My favorite part was teaching them the spiritual lesson at the beginning of each class, with the topics of The Creation Account, Moses Parting the Red Sea, and The Woman at the Well. These spiritual lessons powerfully connected God’s design for water with the technical lesson. It was very memorable talking with these young ladies about what it means when we say that Jesus is our living water. I framed the latter story by explaining that Jesus was speaking with a woman who was disrespected because of her race and gender (I’m sure many of them can relate to being disrespected)…but I told them that Jesus cared enough about her that he wanted to help this woman see her need for Him – that shewas spiritually dead without him, and He wanted to be the refreshment and life-giving sustenance that she needed. I think the light bulb went on for these girls. All in all, education went very well. I was extremely impressed with my fellow teacher Andrew, who did an amazing job staying organized, bringing humor, and speaking way more Spanish without a translator than I could manage. Great job of teaching! I’m so pleased that you are doing this.